A choreography of Lagos, the land for all @ Lagos Dance Exhibition. Fuji Music Mestro, Alhaji Alabi Pasuma with Hon. 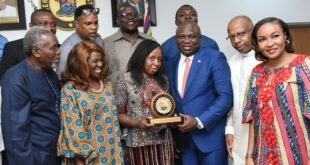 Adebimpe Akinsola during his visit to the Ministry of Tourism,Arts&Culture Hiphop Artist CDQ visits Ag.HC Tourism, Arts & Culture in her office.